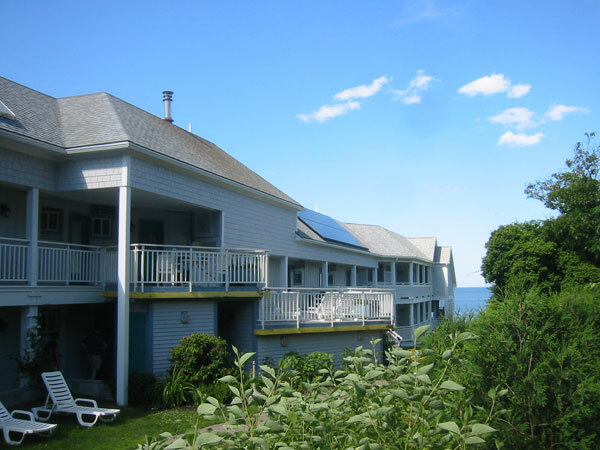 The Beachmere Inn’s solar electric system generates 5-8% of the Inn’s power needs, and solar hot water has reduced oil use by more than a third! The Maine Innkeepers Association highlighted The Beachmere Inn in Ogunquit, a certified Maine Environmental Leader in Hospitality, in their most recent newsletter. The Innkeepers Association also recognized that the inn has been independently family owned and operated for the past 72 years. The 5kW solar electric system covers 5-8% of the Inn’s total demand. According to their website, by mid 2009 more than 7,800 KW kilowatt hours of clean electricity have been produced by the solar array, eliminating 13,100 lbs of CO2. Solar Panels have been installed for Thermal Hot water for over 32 rooms as well as in our employee housing building. Solar Photovoltaic Panels have been installed for production of 5 – 8% of our energy needs. As of June 24, 2009 over 7,800 KW has been produced by solar power a savings of 13,100 Lbs. of Co2. Cold water laundry processes are being used to save electricity by eliminating the need to heat hot water for the laundry systems through Ozone technology. Additional insulation was installed in the exterior walls and ceiling for better building envelope efficiency in Beachmere West. In 2007 we installed efficient, timed irrigation for the lawn and drip irrigation for our planting beds, in 2008 that effort has continued. High efficiency Low E Eagle windows are installed in Beachmere West (2008) and were used for all the window & door replacement at Beachmere South (2008) and in the Victorian (2000 – on going). Since 2000 we have been replacing old inefficient oil burners with Buderus boilers in the Victorian, South and West buildings. In addition to their commitment to reducing energy and using energy from clean, renewable sources, The Beachmere Inn has a host of green administrative, cleaning, and building practices. Visit the Maine DEP website to learn more about Maine’s Environmental Leader program, or call 1-800-789-9802.